12 A None No Power Seat 12 A is a standard Economy Class seat that may have limited recline due to exit row behind. 12 F None No Power Seat 12 F is a standard Economy Class seat that may have limited recline due to exit row behind. 13 A None No Power Seat 13 A is a standard Economy Class seat with extra legroom due to exit row. This seat may have limited or no recline. 13 B None No Power Seat 13 B is a standard Economy Class seat with extra legroom due to exit row. This seat may have limited or no recline. 13 C None No Power Seat 13 C is a standard Economy Class seat with extra legroom due to exit row. This seat may have limited or no recline. 13 D None No Power Seat 13 D is a standard Economy Class seat with extra legroom due to exit row. This seat may have limited or no recline. 13 E None No Power Seat 13 E is a standard Economy Class seat with extra legroom due to exit row. This seat may have limited or no recline. 13 F None No Power Seat 13 F is a standard Economy Class seat with extra legroom due to exit row. This seat may have limited or no recline. 14 A None No Power Seat 14 A is a standard Economy seat with extra leg room due to exit row. 14 B None No Power Seat 14 B is a standard Economy seat with extra leg room due to exit row. 14 C None No Power Seat 14 C is a standard Economy seat with extra leg room due to exit row. 14 D None No Power Seat 14 D is a standard Economy seat with extra leg room due to exit row. 14 E None No Power Seat 14 E is a standard Economy seat with extra leg room due to exit row. 14 F None No Power Seat 14 F is a standard Economy seat with extra leg room due to exit row. 28 C None No Power Seat 28 C is a standard Economy Class seat however, the proximity to the lavatory and galley may be bothersome. 28 D None No Power Seat 28 D is a standard Economy Class seat however, the proximity to the lavatory and galley may be bothersome. 29 A None No Power Seat 29 A is a standard Economy Class seat in the last row of the plane. The close proximity to the lavatories and galley may be bothersome. 29 B None No Power Seat 29 B is a standard Economy Class seat in the last row of the plane. The close proximity to the lavatories and galley may be bothersome. 29 C None No Power Seat 29 C is a standard Economy Class seat in the last row of the plane. The close proximity to the lavatories and galley may be bothersome. 29 D None No Power Seat 29 D is a standard Economy Class seat in the last row of the plane. The close proximity to the lavatories and galley may be bothersome. 29 E None No Power Seat 29 E is a standard Economy Class seat in the last row of the plane. The close proximity to the lavatories and galley may be bothersome. 29 F None No Power Seat 29 F is a standard Economy Class seat in the last row of the plane. The close proximity to the lavatories and galley may be bothersome. 8 A None No Power Seat 8 A is a standard Economy Class seat that may have some extra legroom due to the bulkhead. There is no floor storage for this seat during takeoff and landing. 8 B None No Power Seat 8 B is a standard Economy Class seat that may have some extra legroom due to the bulkhead. There is no floor storage for this seat during takeoff and landing. 8 C None No Power Seat 8 C is a standard Economy Class seat that may have some extra legroom due to the bulkhead. There is no floor storage for this seat during takeoff and landing. 8 D None No Power Seat 8 D is a standard Economy Class seat that may have some extra legroom due to the bulkhead. There is no floor storage for this seat during takeoff and landing. 8 E None No Power Seat 8 E is a standard Economy Class seat that may have some extra legroom due to the bulkhead. There is no floor storage for this seat during takeoff and landing. 8 F None No Power Seat 8 F is a standard Economy Class seat that may have some extra legroom due to the bulkhead. There is no floor storage for this seat during takeoff and landing. Qatar Airways offers a variety of audio channels on this plane. 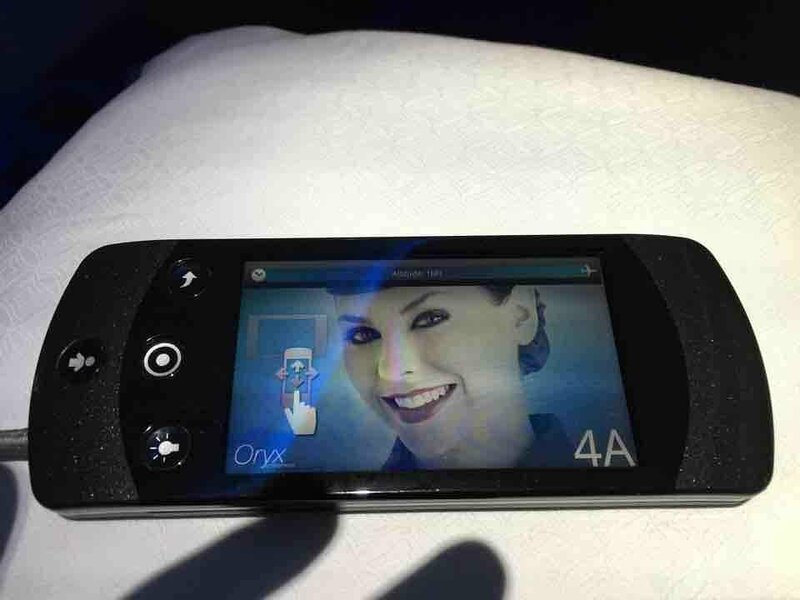 On select flights- each seat has a personal TV featuring Audio Video on Demand (AVOD) with individually controlled entertainment. Each Business Class seat has a 110V AC power port. There is no power in the Economy Class. Qatar Airways operates the A320 on short-haul flights, within the Gulf region. This aircraft flies with 12 seats of Business Class and 132 seats of Economy Class. There may be limited storage space in the overhead bins located in the last two rows since these are used to store emergency equipment. on my flight seat 12F has no recline ,not even limited and when the seat in font of you is at full recline (this will happen most of the time) things are getting very claustrophobic.!!! 12A and F do not recline due to the exit door behind - avoid! 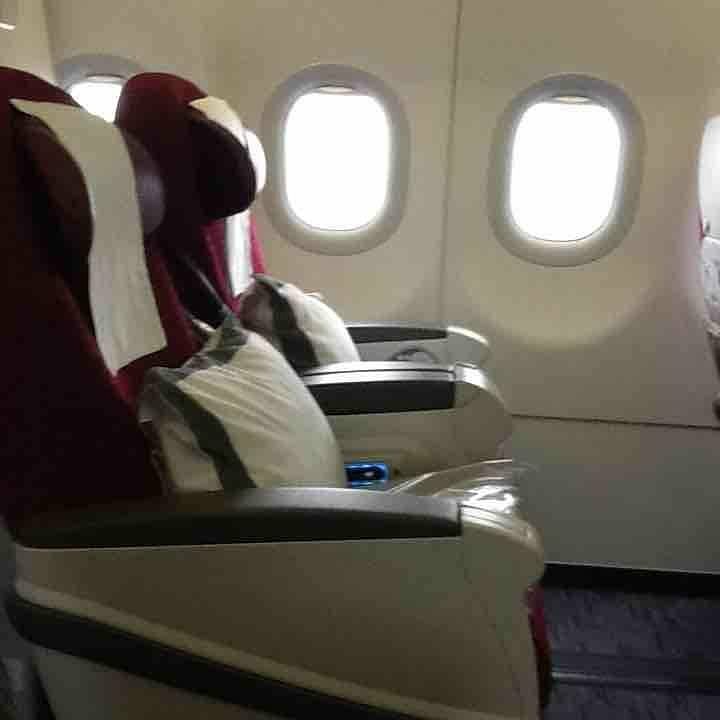 Kathmandu -> Doha (QR 647) still has the very old business class in use (comparable with premium eco). Take the Airbus A330-200 which also operate on the same route for fully flat seats. Cramped and uncomfortable for a 6 hour journey in 'premium' class. 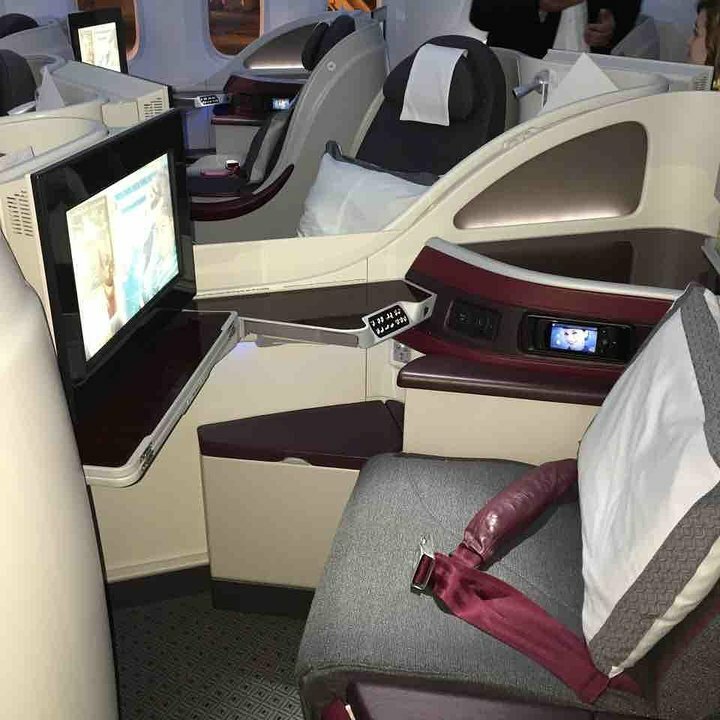 Time Qatar upgrades its 'worlds best business class' on flights to Africa. No personal TV. You can see the TV over the head. Recommend that in your mobile phone, take some movie. I flew this recently on a 5,5 hour international flight on Business Class. For 2016 Business Class standards I found it astounding there was no built in IFE (video screens) or power outlets per seat. They handed out small iPads for passengers... which is sort of OK if you can get over the always buckling case/stand you had to hold constantly and the small screen. Due to bulkhead there is no legroom at all, avoid 1st row. 2nd and 3rd row are only slightly better, I felt very uncomfortable in this cramped condition. Very limited recliners. Limited storage capacity in overhead bins. Underneath seats 16E and 16F are entertainment boxes. Sitting in 17E and 17F you cannot keep both of your legs straight underneath the seat in front. You have to sit in an angled position. This applies to all the economy seats E and F. The aisle seat D is the best. Traveling from BUD to DOH on the A320 was a very pleasant experience. We were traveling with five children, which when flying, isnt necessarily a fun experience usually. But, the flight attendants went above and beyond to make it as comfortable for us, and the other passengers. We had some seats in row 14 and some in row 15. It is great when traveling with children to have the extra space in 14. But, because the armrest do not fold up, it can be a bit of a nuisance when your child is trying to sleep. This seat has full recline as all the others in last row. 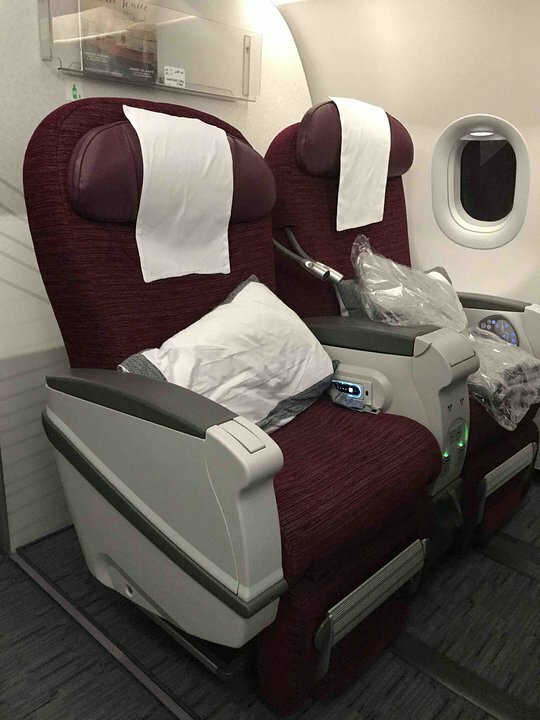 I choose seat in last row every time while flying on Qatar A320 because once I spent about 45 mins trying to come back from the toilet to my seat in 9th row. 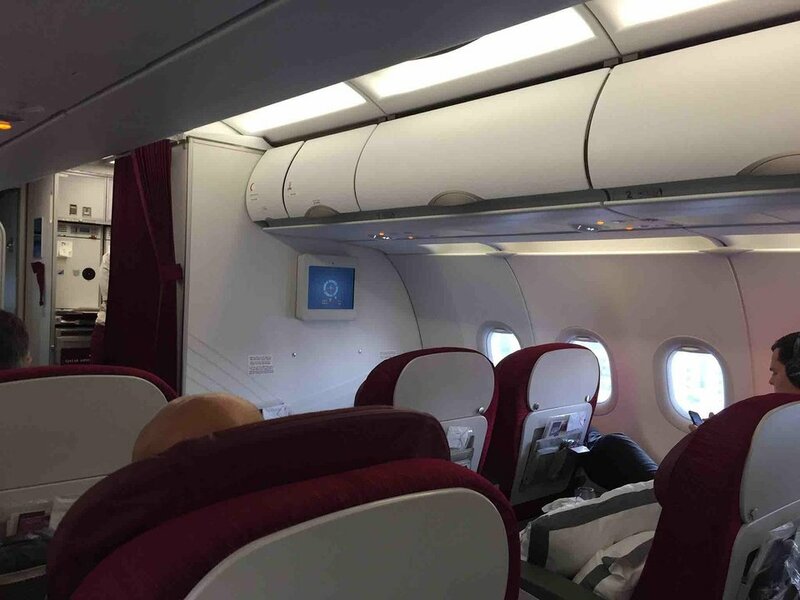 Qatar Airways flies 2 versions of Airbus A320.